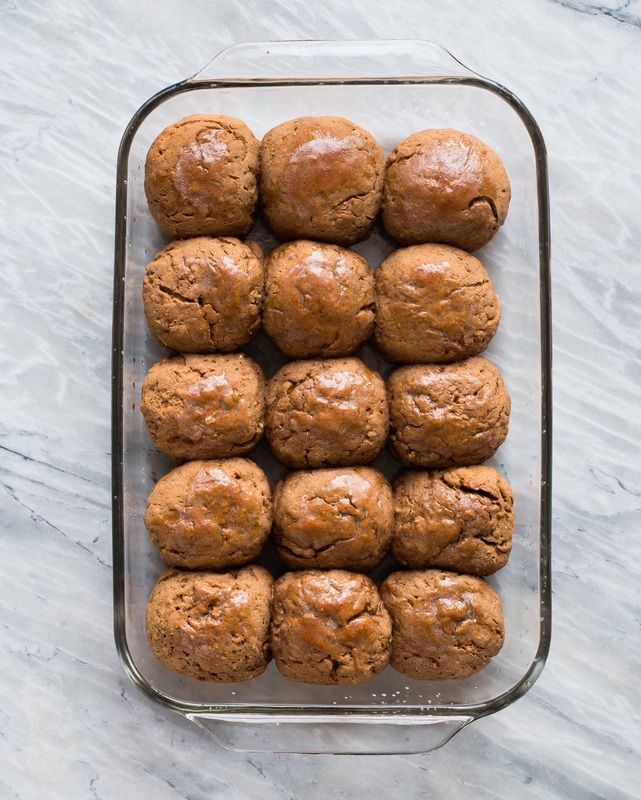 Soft, sweet gluten-free rolls made with rolled oats and molasses. Recipe created by Café Johnsonia. (1) Place the oats and milk in a microwave safe bowl. Cook for 2-3 minutes, or until most of the milk is absorbed. Let stand for 5-10 minutes to cool. (2) Meanwhile, in another bowl, dissolve yeast in warm water. Stir in sugar and let stand for 5-10 minutes, or until foamy. (3) Sift or whisk together the flours, starches, xanthan gum, and salt. Set aside. (4) Place the soaked oats, eggs, molasses, melted butter (or shortening), and brown sugar in the bowl of an electric mixer fitted with the paddle attachment. Turn mixer on to low speed and mix well. Add the yeast, and mix again on low until combined. (5) With the mixer still on low speed, add half of the gluten-free flour mix. Stop mixer and scrape down sides. Turn mixer on to low and add the rest of the flour. The dough will be very, very sticky. Turn the mixer onto medium-high speed and mix for 3-5 minutes. (6) Remove bowl from mixer and scrape down the sides. Let stand for a few minutes. The dough will thicken during this time. (7) Lightly coat the inside of a large mixing bowl with oil. Transfer the dough to the bowl and turn it over to so all of the dough’s surface is coated with the oil. Cover with plastic wrap and let rise in a warm place for one hour. It will not double in size, but it will rise up quite a bit. (8) Oil a 9- by 13-inch baking pan. (9) Using oiled hands, form the dough into rounds about the size of a mandarin orange. Be careful not to squish the dough down too much as the rolls are being formed.The dough will be very soft and sticky. Use a little more oil as needed. Arrange in five rows of three for larger rolls. For smaller rows, arrange in six rows of three. (10) Cover the pan with plastic wrap and let rise for one hour. (11) Preheat oven to 400°F about 20 minutes before the rolls are finished rising. (12) Bake for 20-25 minutes, or until golden on top. Let cool for a few minutes and serve. Rolls are best when warm, but are also good at room temperature. For a prettier presentation, brush the tops of the rolls with melted butter as they come out of the oven. Before baking, a sprinkling of more gluten-free oats can be added to the tops as well.